If you’ve started exploring Coursera’s new Specializations, you’ve probably noticed that we’ve reintroduced start dates and soft deadlines for some courses on our new platform. We’ve received some great questions about this change, and you’ll find a few answers below – along with a little Coursera history lesson. The philosophy: Why do we need start dates and deadlines? Coursera’s earliest courses followed a standard academic schedule, with weekly deadlines and quarterly or annual sessions. As our community grew, however, our learners and partners pushed us to challenge traditional structures. In 2014, we began rebuilding our platform to cater to a wider range of teaching and learning styles. The first courses on the new platform offered content “on demand,” with no deadlines and or fixed schedules. While this flexible format had many benefits, we lost something, too. Tools like forums and peer grading weren’t as effective when everyone completed work at a different pace. And, as it turns out, most of us need at least a little structure to learn effectively. Most of us are like Calvin*. We need a deadline! With sessions on the new platform, we’re working to balance structure and flexibility. Sessions run about once a month, so you’ll never wait long to join a course. And you’ll receive credit for all work submitted before your session end date, even if you miss the occasional weekly deadline. If you don’t finish the course in one session, you can transfer to the next and pick up where you left off. In short, we’re aiming for just enough structure to sustain motivation and build community. We hope to see you in an upcoming session – and we hope the new format improves your Coursera experience! Interested in the philosophy and psychology of learning? Check out UC San Diego’s popular course, Learning How to Learn, or other education courses and Specializations. Will all courses now have start dates and deadlines? No and yes. Some courses will run with sessions, and others will remain “on demand”. Both formats, however, will offer suggested deadlines. In on demand courses, you can turn off or adjust deadlines if the suggested schedule doesn’t work for you. What if I miss a suggested deadline or don’t finish the course in one session? No problem. There are no penalties for missing deadlines. If you fall behind in an on demand course, you can adjust the suggested deadlines, or turn them off. If you fall behind in a session-based course, you may need to transfer to the next session, but your record of completed assignments will transfer with you. How can I find courses that are on demand or have sessions starting soon? 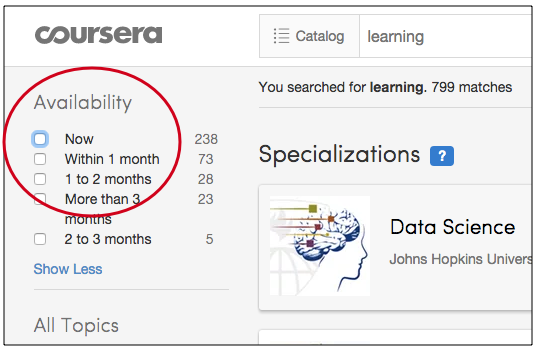 Type a keyword in the catalog search bar at the top of the Coursera home page to find courses on a topic you’re interested in. Then, use the availability filters on the left-hand side of the page to find courses that are on demand or have active sessions open for enrollment or have sessions starting soon. Can I join in a session after the start date? Session enrollment closes a few days after the start date, so if the session just started, you’ll still be able to enroll. Enrollment for the next session will open as soon as enrollment for the previous session closes, so you can sign up for the next session if you miss the window. What can I do while I’m waiting for my session to start? As soon as you join a session, you’ll be able to preview the first week’s videos and assignments. All remaining content will become available on the start date, so you can feel free to work through the first week right away, and dive into week two when the session begins! Visit our Learner Help Center to learn more about sessions, deadlines, and other Coursera features.